The Eucharistic Adoration for Peace is held in the Armenian Catholic Church, near the fourth station of the Via Dolorosa in Jerusalem. This service of prayer was begun on March 25, 2009, with the establishment of the community of the Sister Disciples of the Divine Master. 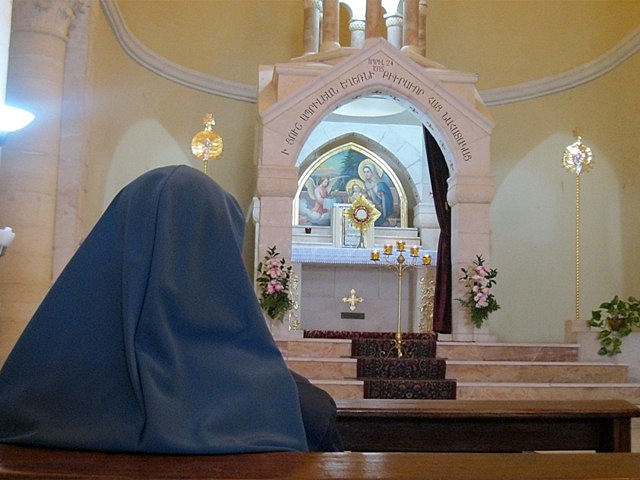 The perpetual Eucharistic Adoration is sustained by the Sisters with the collaboration of lay volunteers and pilgrims who find themselves in that oasis of silence. In fact, the adoration chapel attracts a growing number of persons who participate in the prayer. We invite all those going to Jerusalem to stop to share in this unceasing prayer for peace before the Most Blessed Sacrament. The adoration is conducted in silence. If there are groups that wish to pray as a community, they may make reservations by sending a message to: Jerusalempddm@gmail.com or by calling: (972) 0972528310148. The exposition of the Blessed Sacrament begins at 8:00 AM and concludes with Evening Prayer at 5:30 PM.